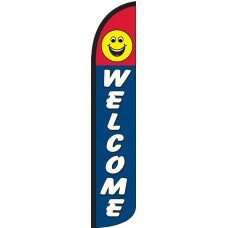 A welcome Feather Flag is an ideal choice which will help to decorate your business and make your customers feel at ease when they enter the property. 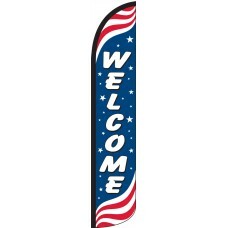 An exceptional customer experience is what sets great businesses apart, and it is the small touches, like welcome flags, which can really make your business exceptional. Each flag has been designed by our graphic design department to attract new customers. These flags have been shown to dramatically increase the visibility of a business. They also serve as an advertisement tool, informing the prospective customer that your business is open to the public and ready for business. The can be used in conjunction with our other flags to create attractive and coordinated displays which enhance the visual appearance of your business. This along with the fact, that they are incredibly cost-effective, makes utilizing them on your property a great decision!